These days, marketing your business on Instagram takes much more than just Instagram. (Sorry, IG. We love you, too.) You may need a few Instagram apps for business to help you balance the workload. Think about it: You’ve got to capture high-quality photos and videos, edit and design them to match your brand aesthetic, equip them to engage and convert, post them in the most convenient way possible, and figure out what content is working. Whew, there’s a lot involved in Instagram marketing! How does one manage it all? Don’t fear! We’ve compiled a list of Instagram apps for business that can help with all of those things. Pop open your App Store or Google Play store and prepare to download the programs below. They’ll transform the way you manage and market your business on Instagram. 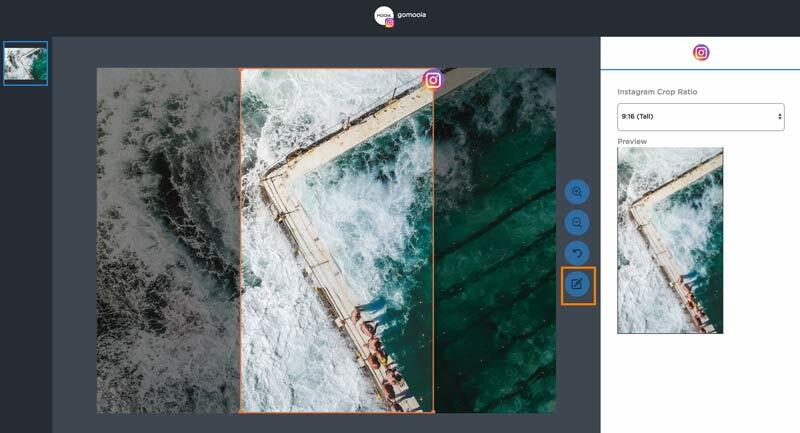 While Instagram offers a decent in-app camera and editing suite, businesses should take it a step further to stand out from the crowd. Thankfully, there are a number of photo editing apps can transform your boring images into a cohesive brand aesthetic. Whether you’re filtering your photos, covering up a background blemish, or attempting to take better selfies, these apps can help you out. Snapseed is a free photo editing app by Google. While its filter options aren’t as extensive as VSCO (which we’ll talk about later! ), its editing suite is more intuitive. You can opt for an automatic adjust or edit and enhance specific parts of your photo. The user interface on Snapseed is also super easy to navigate. VSCO is a super popular photo editing app – and hashtag. (Seriously, check out #vscocam on Instagram) The free version is easy to use and provides a better editing and filtering suite than Instagram. It’s easy to hop in, throw a filter on a photo, and save it back to your phone. You can also adjust lighting, shadows, and other features. VSCO also offers an in-app membership through which you can sign up, share your images, learn more about photography, purchase new filter or photo packs. Many users showcase their work through VSCO, too. If you’re an individual or photography-specific brand, this community may be worth joining purely for the exposure. A Color Story was founded in 2016 by the creators of A Beautiful Mess. Its mission is to help users create fresh, colorful photos. If you’re a designer, photographer, florist, or painter, this app is for you. With 100+ filters, 40+ effects, and 20+ tools, A Color Story can make your entire Instagram grid pop with color. The gals from A Beautiful Mess also created a cool graphic design app for Instagram called A Design Kit. I’ll talk about it more below. Calling all selfie lovers! If selfies are critical to your Instagram strategy (hello, bloggers, fashion moguls, and makeup and hair artists), LINE Camera is for you. This free app will transform your selfie strategy in an instant. For one, LINE Camera’s self-facing camera doesn’t flip your image as the Camera app does. It turns your entire phone screen into the shutter (so you don’t have to reach for miles for the bottom button) and provides a self-timer for group or distance shots. It also offers in-app filters, stamps, and editing – you can smooth your skin, enlarge your eyes, and reshape your face. If you’re a food blogger (or just a food lover, like me), LINE Camera has an app for you, too! Taking a page out of their selfie book, LINE Camera released Foodie, a free app specifically for taking food images. With Foodie, you don’t have to worry about lousy restaurant lighting (ahem, ambiance) or whether your camera is directly above your plate. Its smart guide helps you align your phone for a perfectly level photo. It also provides filters designed for specific foods and drinks, such as Tropical, Picnic, Fresh, BBQ, and Crispy. Cleaning up and filtering your photos is important when striving to provide high-quality, well-shot images for your followers. But what if you want to organize your photos differently or add a text overlay (or just a text post)? That’s where these Instagram apps for business come in handy. A Design Kit is a graphic design suite by the same makers of A Color Story. In fact, it was released just a few weeks ago! Between brushes, text, and stickers that “no one else has,” there are a ton of options for adding a simple design to your image. Whether announcing an event, adding a fun background to your photo, or including a cute call-to-action, this app can help. And you know the options are going to be neat given how creative and colorful the website and app interface is! Over is a super popular graphic design app for Instagram. At the moment, it’s only available for iPhone, but that hasn’t stopped it from helping marketers, social media managers, and Instagrammers worldwide create impressive images. In Over, you can add text, stickers, and overlays to your images. You can also upload your entire brand suite to Over, making it easy to access your brand logos and fonts when editing images. Short on time? Grab one of the thousands of pre-designed templates or scroll through millions of free stock photos to get started. Over also helps you create accurately cropped images for Instagram and Instagram Stories, as well as Pinterest, Facebook, Twitter, and more. Most of their features are free, but it’s worth looking into purchasing their paid features, too. Note: Also from Over is a free design app called Quick. Aptly named, Quick only offers text overlays but claims to be the fastest app for adding text to photos. This app is perfect if you’re merely adding a quote, call-to-action, or more before posting an image it to Instagram. Next, click on the ‘Edit image’ icon . This will open the Photo Editor. Then, choose the effect you’d like to add to your image from the sidebar menu and apply it to your image. Once you’re happy with the way it looks, click save. All that’s left to do then is schedule it to post on a specific date or add it to your queue. 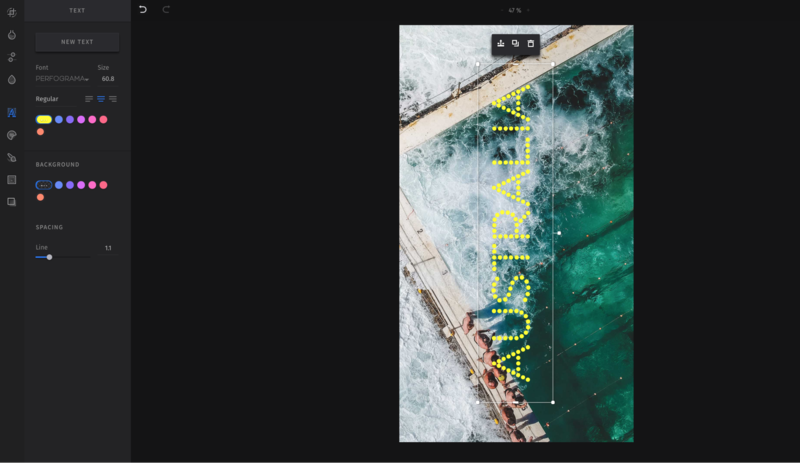 Canva is a free design app that’s similar to Over, except it was initially a desktop software (and still is). They now offer iPhone and iPad versions, but if you’ve worked with the web app, these mobile versions can seem clunky. Just like Over, Canva offers hundreds of fonts, stickers, and designs with which you can create all kinds of images. Pull in your own photo or start with one of their thousands of templates or stock photos. Download for free for iOS and Android. (Note: You can also use Canva to create and add graphic design elements to your images from inside of Sked using our Canva integration. Just click on the ‘Create banner with Canva’ option when you’re uploading a post and you’ll be taken straight to the Canva interface. Instagram activity shouldn’t stop with photos and Stories. Videos on Instagram are just as valuable and can engage and interest a different audience, so they shouldn’t be ignored. If you aren’t quite sure how to integrate video into your strategy, check out these apps. Ever seen those videos that show the sunset, sped up? That’s a time lapse, and Instagram has an app to capture those. Hyperlapse from Instagram is a free app that helps you take time-lapse videos, which are basically a ton of images stitched together in a fast-forwarded video. Hyperlapse lets you choose the speed of the video and also offers video stabilization, so you don’t have to worry about holding your phone perfectly still. Time-lapse videos are great for featuring lengthy processes in a short amount of time, such as makeup application, painting or sculpting, or a recipe. A boomerang is a short video that repeats three to five seconds of the same content backward and forward. It’s basically ten photos taken simultaneously and then stitched back together in a loop. Boomerang from Instagram helps you capture those video loops to share to your feed or Instagram Story. Instagram also offers this feature in their Stories screen, but with the Boomerang app on your phone, you can capture multiple videos and then choose which is best for posting. Capturing and editing your Instagram photos and videos is merely half the battle. Next, you’ve got to post them! Check out the below Instagram apps for business to help you publish and manage your Instagram content. If you haven’t looked into adding Regramming to your Instagram strategy, you should do so. It’s a simple way to diversify your content, and it’s easy with apps like Sked Social Regram. At the moment, Sked Social Regram is only available as a Chrome extension. Regardless, this web app makes it super easy to discover and repost user-generated and brand collaboration content. It also ensures your content is posted with the original account’s information, so you never forget to give credit. Download it for free on Google Chrome. Repost for Instagram is another helpful Regramming tool available as a mobile app. Once downloaded, you can simply copy the URL of an Instagram post and then access that post within the Repost app. From there, you can post the image back to Instagram, complete with the original poster’s Instagram handle and caption. Liketoknow.it turns your Instagram into a shoppable feed. Frequently used by bloggers looking to earn commission, Liketoknow.it equips your followers to like your photos and eventually purchase the items you feature or post. All you have to do as the Instagrammer is include a specific URL in your caption. At this time, Liketoknow.it is available on an application-only basis. So, you’ve captured all this great content and edited it to perfection. Now it’s time to sit in front of your phone and post…post…post, right? No way! Sked is a web app that connects to iOS and Android to schedule and post your content for you! Sked helps you save precious time by posting your content for you. That’s right – no push notifications to your phone, meaning that our mobile app isn’t necessary. (But you can download it for free if you’d like!) Sked also offers an in-app editing suite, carousel posting, and the addition of the first comment – where you can tuck all your hashtags. The final piece of the Instagram marketing puzzle is ensuring that what you’re doing is working. We’ve compiled an extensive list of Instagram analytics apps that’ll help you answer that question for your business. I encourage you to utilise at least one of those Instagram apps for business so that you can learn more about what kind of content and posting times works best for your audience. Marketing your business on Instagram involves a lot of moving pieces – we totally get it! Between capturing and editing content to posting and reposting to analyzing, there’s a lot that goes into marketing your business efficiently and effectively. We hope these Instagram apps for business help you market on Instagram better, smarter, and more creatively. Now that you know all about the best Instagram apps for business, why not start carving out hours in your social media workflow by signing up for Sked’s 7-day trial. Our all-in-one Instagram scheduler allows you to automatically post images, carousels, Stories, videos and more. Tag locations, users and products and manage all your hashtags in one place to save 5+ hours every week.